As regular readers know I often highlight free books, patterns and resources that I discover online. 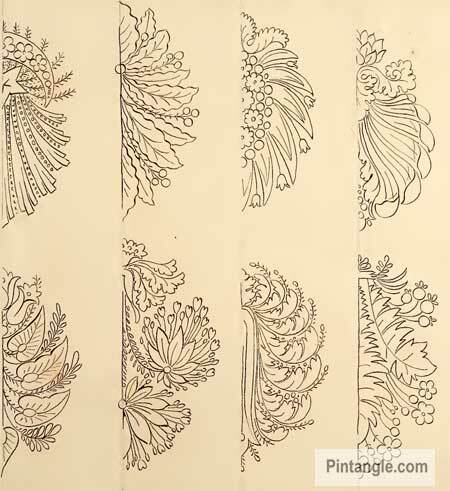 On the archive.org site I discovered and French design book the Directoire designs for textiles which has been digitised by the Internet archive. 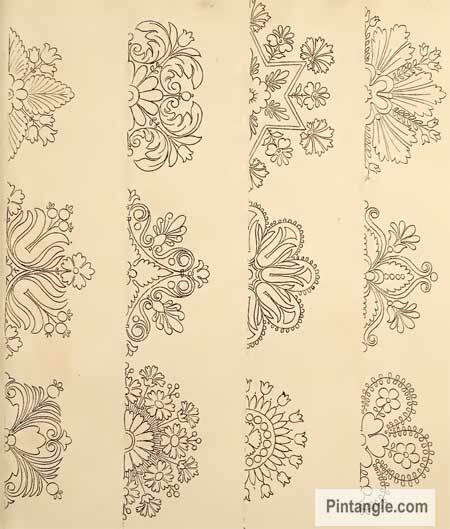 The Directoire designs for textiles is an out of copyright pattern book that was published in 1793. The patterns are French and the book is catalogued as containing over 100 drawings. I have a few of the patterns here so you can get a taster of what is on offer in this old French design book. Many are half the pattern so you have to trace them off on tracing paper – flip it and then you have 2 sides of the pattern. They look great for biscorno pin cushion patterns or any project where you want a medallion. I was very tempted to clean up some of them in Illustrator and present them whole but life got in the way. You can download the file in a number of formats PDF which is the file format I think most people use, but you can also get a full Test download and formats such as EPUB and Kindle. If you are new hand to embroidery here is 12 Surface Stitches for Beginners a PDF file I wrote a while back. These surface embroidery stitches can be used with these types of patterns. Also check out the first few weeks on the TAST list of challenge stitches, for links to tutorials to the basic stitches. Thank you so much for this wonderful trove of designs and stitches. I have recently retired and am getting ready to learn all the gorgeous stitching that I have admired since childhood. If only, I had badgered my grandmothers to teach me all that they had learned from their mothers snd grandmothers. Hi.. These are really brilliant. I love old designs though they are very rare. May god bless you for your efforts. Really thanks. Generously working overtime again, I see, on behalf of needleworkers. Thank you for sharing the templates. I’ve saved them for future projects as well as more from the wonderful book. Thanks so much for sharing this. It looks like a great resource of designs and ideas, so many possibilities. You are so generous in sharing your finds and talent with us. Thanks Janet pleased you like the resource. Thanks So much! This is a wonderful resource and the designs have so many possibilities. These are so lovely. I did some research, and Abe books will do a reprint of the entire single edition for a little over $6. It ships from India, so it make take up to 25 days to get it after it’s printed and shipped. I thought it was a good deal, so I ordered it. Abe Books is a great resource for things like this.